Music is a great way to keep the jobsite from getting dull. With the Ryobi P742, you can listen to music on-the-go, at home, or in your workshop, all in a day with a single lithium ion battery. The P742 is an AM / FM radio that also acts as a Bluetooth speaker for your smartphone or mp3 player. Its compact design makes it easy to bring with you anywhere, and the back straps allow you to keep your music device connected to it. An all-in-one entertainment system, it even has an onboard clock that will help you keep time on a camping or hiking trip while you jam out to your favorite tunes. From the campsite to the jobsite, to the office to the home, you'll be hard-pressed to find a place where this radio doesn't shine. Simply plug in a One+ 18 Volt battery, and you'll be ready to listen to music, the weather, and the news for hours. 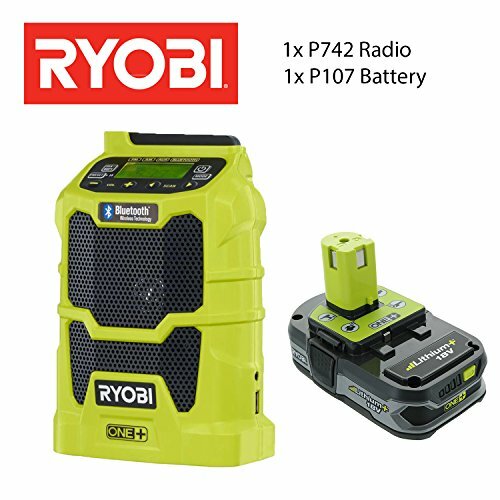 Ryobi P742 18-Volt AM / FM Radio Bluetooth Wireless technology, which is an excellent addition to any collection of tools RYOBI, that allows users to flexibly transfer audio up to 30 feet. Built-in USB port with 1 amp is suitable for charging your mobil devices.Users can switch between AM / FM, Aux-in and Bluetooth. This Ryobi radio is designed with a digital LCD screen with a clock, which also displays a low battery indicator. Radio can be powered by any 18-volt One + Li-Ion or NiCd battery, one battery for all your Ryobi tools. If you have any questions about this product by RYOBl, contact us by completing and submitting the form below. If you are looking for a specif part number, please include it with your message.